Acoustic roots and blues with soulful vocals, slide and finger style guitar and stompbox foot percussion stripped right down to a place that makes you wanna listen to it again and again. 10. Why Do Boys Do That? 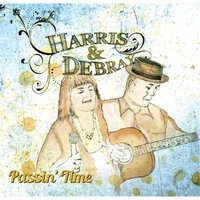 The dynamic blues/roots duo Harris&DeBray is an offshoot of the popular Vancouver act Lesismore. Made up of singer Leslie Harris (vocals and stompbox foot percussion) and guitarist Curtis DeBray (acoustic guitar and vocals) it is wowing audiences with its hip renditions of traditional blues songs, some roots classics and new original music. This cd will see the group move into some touring and festival work in the coming seasons. Catch them at your local live venue while you can cuz these guys are on the move!